Part of being a responsible driver means always being proactive. This means that you take the initiative to stay safe and do your best to keep others on the road safe too rather than depending on other drivers to keep you safe. 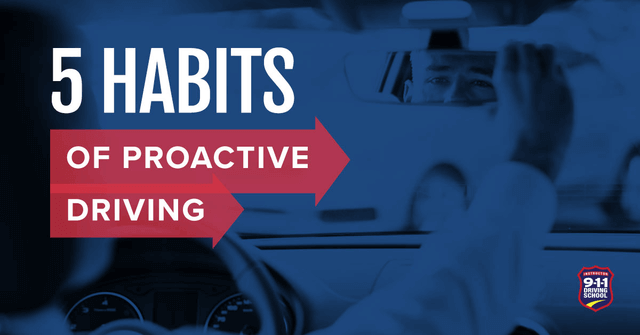 Here are five habits you can develop to become a proactive driver. Don’t let yourself react to the other drivers around you. Don’t get upset if they do a bad maneuver or are aggressive toward you. Road rage incidents are becoming more dangerous with the number of people pulling out guns is increasing. Instead of overreacting to other drivers. Make sure you remember that safety is the most important part of driving. It usually takes two people to fight, so if you ignore their behavior or just do your best to not engage them, you can avoid a lot of problems. If the other driver stays aggressive, call the police to come. Too often, these situations turn dangerous. There are several important steps that help keep you and the passengers in your vehicle safe. Since you are responsible for those riding in your car, never start driving until everyone is buckled in properly, including yourself. Remember other important safety steps, like signaling before turning, merging, or changing lanes. Always use your hazards if sitting on the side of the road and keep a safe following distance with the car in front of you. It’s important to stay focused on the road and your surroundings. If you are distracted by a cell phone, friends, or trying to change a music station, you are not driving proactively. Keep distractions to a minimum, being aware of pedestrians, light signals, traffic patterns, and all the other movements around you. Watch the driver ahead of you carefully, to monitor their speed and if they are braking. This will help keep you safe and ready to go or stop if necessary. A major part of proactive driving is knowing what is going on around you. When you first enter the car, make sure that all mirrors are positioned so you can see out of them all properly. Keep an eye on what all drivers around you are doing and know where they are positioned. This helps you be more aware of someone being in your blind spot. Before changing lanes, speed, or any direction, check all your mirrors and your blind spots to make sure you do it safely. Whenever you are about to pull in to an intersection or traffic of any kind, try to anticipate what other drivers are doing. Intersections are an important place to watch what other drivers are doing. Knowing when you have the right-of-way is important, but if it is your turn and another driver starts to go, drive carefully. It’s also a good idea not to rush into an intersection right when the light turns green. Vehicles traveling the other direction might try and get through as their light turns red. Remember that it is more important to stay safe than prove you’re right. Proactive driving takes a lot of practice to get right, but once you get used to this style of driving, it becomes second nature. It takes time to recognize the habits you should develop. Do a lot of self-evaluation and watch other drivers when you’re a passenger. The best part is that it helps increase your chances of getting everywhere safely when you’re behind the wheel.